Materials for the pee and poo toilet. Plywood, particle board or any type of board. 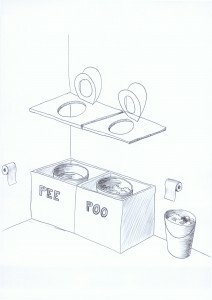 How to build the pee and poo toilet. Any material can be used to make a simple box for the buckets to be placed in. Plywood is easy and good. Cut each side of the boxes as wide as the length of the toilet seat and 20-30mm higher than the bucket you are using. Measure the top of the boxes and cut a top to fit over them. The boxes can be built together like in the picture or separated. This will depend on the space you have available. Take the top and put the toilet seat over the centre and draw around the inside hole of the toilet seat. Then cut a hole around 15mm larger than what you have drawn. We passed thru ChCh recently and wondered at the angst over Porta loos as we have been composting at home using a home-built 2 chamber wet design for 20 years. So it is great to see your efforts. However we live on a boat for long periods and have the vexed question of holding tank regulations. If you don’t have holding tanks you face big fines but what happens to the chemically treated poo? It is either pumped out to conventional sewer system which end up as grey water or is discharged out at sea, an awful prospect either way. The intention is to heave the result into our composter at home. Have you any comments on this and on the legal requirements re boats and holding tanks? PS Your approach should be Government policy! Stand alone composting toilets, rain water tanks and small solar systems would make for stand alone self sufficiency of dwellings in any emergency. Do you lobby your government? I realise that you’ve been trying to keep construction as simple and portable as possible for the post-emergency situation, but I’d welcome your comments on the use of a tallish vent pipe to eliminate smell from a non-separated system. On an off grid property, we have a shed that isn’t quite wide enough for two stalls, and the boys can pee on the nearest comfrey plant anyway. From what I’ve read, if the box is sealed enough to have only one entrance (the seat) and one exit (the vent) the chimney effect creates enough negative pressure to remove all odours. Biggest problem being to seal the roof around the vent. You are discussing permanent set ups, which have quite a different focus and what you are suggesting is depositing straight into a larger chamber, opposed to buckets that can be emptied for composting. In a more permanent set up, a vent pipe is very beneficial. Metal is good to conduct heat better, painting black is also beneficial. Attaching a small computer fan, (which are all 12v) to the pipe is also I have set up in areas where airflow is restricted (i.e. wet damp frosty locations in the middle of winter). The fan can be attached easily directly to a car battery and draws VERY little energy. The pipe is best tapped into the highest point possible and if you vessel/chamber underneath is large enough, you can have it next to the toilet seat at the same level. many systems you buy have shoots to deposit through, with the chamber below. This is great for regulations to ensure deposited material is not able to build up to a height that is near to ones backside. However, because the deposited material mounds up under the shoot, heat, moisture all rises up the shoot and condensates under the seat. In this circumstance it is important to have the vent coming off the top of the shoot, rather than the chamber. This is a design problem I have seen with many systems, especially not fan assisted. So vents need to be at the highest possible location. Another tip on this front is to use the off cut where you cut out the hole for the toilet seat and put a backing piece of timber on it, larger than the off cut to create a plug. So in-between deposits use this instead of putting the seat down. Any condensation that might occur, (if the system is not vented properly) will occur on the plug, rather than the underside of the toilet seat. Lastly, I suggest having this type of toilet system on the south side of a dwelling, or in a shaded location. This reducing the composting happening while the chamber is in place and leave the composting upto the phase when it is set aside. This reduces heat build up and again condensation levels. I have set up a variety of sealing systems, the best being old seals for car door frames. It fits perfectly over the lips of many containers. Anyway I hope this helps some what Richard. I could go on a lot about this, but is hard on a keyboard opposed to in person. We get that question lots too: “Why separate pee and poo?” Your answer is great. The quakes in Christchurch and Japan have helped people here in Portland, Oregon – in the Cascadia Subduction Zone is overdue for a big quake – focus on preparedness. Apartment dwellers will especially welcome your model: they can easily preposition the materials and instructions needed to build the no-mix twin toilets, while shared wheelie bins are close at hand. And as separation of pee and poo is better understood, we see more people adopting composting toilets BEFORE the emergency as well. Why separate pee from poo? We use 1 20 litre bucket for both. It only gets smelly after 3 or 4 days, by then it is long emptied out on the compost heap. Us guys can also pee into plastic bottles and make a lemon tree’s day with the product. Huge lemons are the result! This is something that has come up a few times. I realise that Joe Jenkins recommends not to separate in his book The Humanure Handbook (which is a really great reference book that is also available online). This is because Joe is describing a aerobic (oxygen-rich) thermophilic (hot) composting system. He uses the heat to kill off the pathogens very quickly. To get the heat you need to have quite a high nitrogen to carbon ratio in your compost. The pee is very high in nitrogen and if you don’t separate then it will give the compost a real nitrogen boost, and will help it get hot. To get it hot enough you also need to have sufficient mass – e.g. enough compost going in at once that it will heat up. In the Christchurch situation we have been looking at a few different composting toilet solutions that are easy for people to make and manage and use readily available materials. For the home build option we decided to go with wheelie bins as the composting bin for a few reasons. One: we have used these successfully before. Two: It keeps everything contained. So if someone loses interest or mucks it up, it is all nicely contained and won’t contaminate groundwater or be rummaged around in by animals or children. Three: they are easy to get hold of. The wheelie bin is not large enough to use as a hot compost container. So instead of worrying about trying to get it hot, we are focusing on a slower, aerobic composting process. The pathogens are still removed, it just takes a bit longer. By separating the pee and poo and just composting the poo, we keep the moisture levels down and ensure that it doesn’t get all sludgy and anaerobic in the bottom. Even if you do try to separate you’ll find that some pee gets in anyway, so you can add in a little extra of the cover material to soak it up. We have also fitted taps on the base of the wheelie bin, and you can decant any liquid off and just pour it in to the top again so that it is absorbed into the compost. Both way’s work. We just felt that for the Chch situation, where people are looking for intermediate, home-built solutions a separating system is simplest and safest.